Ingesteld door het natuurpark van de Loire-vallei, ideaal gelegen voor het verkennen van de kastelen en wijnstokken yard: Chinon, Saumur, LOCHES. Authentiek Frans 16e-eeuws herenhuis LA COQUETIERE in PORTS sur VIENNE met uitzicht op de rivier de Vienne, omgeven door 5 hectare dromerige tuin met duizenden rozen, bomen en fruitbomen. Prachtige tegels bedekt en door de zon verwarmd zwembad (geen chimical systeem) 5x10 Meter met spa en zonnige terrassen omringen door stenen muren. Vissen, kanoën, paardrijden, restaurant en zijn 5 minuten in de vallei. Het Logis is samengesteld uit een grote woonkamer met authentieke open haard, imposante balken, volledig ingerichte keuken: oven, koelkast, vaatwasser, magnetron, servies, koffiezetapparaat. Bijkeuken met wasmachine, boven 4 slaapkamers, allemaal even stijlvol, 3 met tweepersoonsbedden, 1 met 4 eenpersoonsbedden ideaal voor kinderen, 2 badkamers met douche, 1 badkamer, 2 toiletten. Het pand is veilig gesteld en goed uitgerust om een ​​vakantie met het gezin zo ontspannen en plezierig mogelijk te maken. Het heuvelachtige en beschermd landschap met schitterende wandelingen naar wilde dieren, planten ontdekken zoals velden van orchideeën. Een weelderige moestuin bieden verse en biologische groenten en fruit. Een open schuur bieden een zeer veilige spel voor kinderen, het is vol speelgoed. Het overdekte zwembad omsloten door stenen muren is zeer veilig, er zijn 4 grote treden om binnen te komen met een spa. Het is exclusief voor onze gasten. De eigenaren zijn verrukkelijk, vertellen graag over wandelingen, fietspaden, paardrijden (stallen in de buurt), markten en zomerfestival. De plaats is geclassificeerd 3 sterren door de instantie voor toerisme. 1 badkamer, slepen onafhankelijke doucheruimte een boven een beneden. Tow toiletten. De grote tuin met verschillende thema en geheime plek is ideaal om te ontspannen, op 30 minuten van het historische plek als de middeleeuwse stad Chinon en is het kasteel, ideaal voor een bezoek aan de Châteaux de la Loire. We had a thoroughly enjoyable and relaxing stay. Hosts Christophe and Claudine couldn’t be more helpful. Ideal for those wanting to get away from big city life. Pool was great and the property was very cosy. Kitchen, although small, is functional and all utensils and Crockery provided. Loved the little touch of providing some welcome essentials such as milk, eggs, Goats Cheese, Wine. We hope to see you an other time. 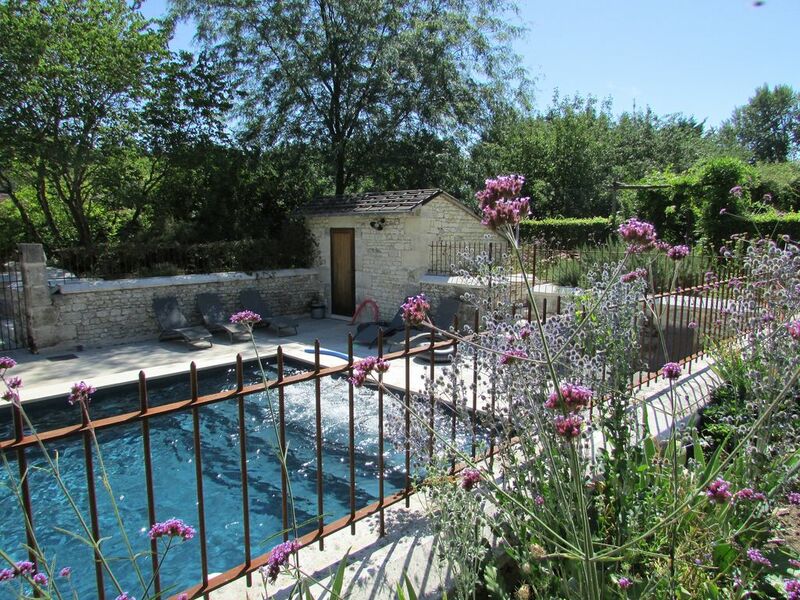 We had a delightful stay at La Coqueitiere in July 2018. The property is marvelous, very secluded with virtually no traffic on the surrounding roads. The pool is wonderful and everything exceeded our expectations. The owners Claudine and Christophe were very welcoming and pleasant, and although they live onsite you would not have know they were there the majority of the time. A particular treat was Claudine providing fresh fruit and vegetables from the garden. Thank you very much, we are very please, you enjoy your Holidays in La Coquetiere. We hope to see you an other time. Autumn is also a lovely season warm, but just what we need, beautiful color, and mushroom to discover in the forest. Bonsoir à toute votre famille. My husband and I stayed for a week with his mother and father and our dog. On arrival, Claudine welcomed us warmly, and showed us around the house and grounds. We were made to feel very welcome, and to treat the place as home. We were encouraged to walk in the grounds and surrounding fields, use the range of available bicycles to explore and to make use of the fantastic pool! The house: Lovely and cool to come into from the heat of the sun. Full of character with beams, stone floors and walls. An open fire (that we did not use...!). The bedrooms were comfortable, although us English found the weather a bit hot, so a fan may be useful for comfortable sleeping. Very clean, wonderfully furnished and we thoroughy enjoyed the evenings in that we spent at La Coquetiere. The pool/grounds: The pool was a perfect temperature - refreshing but not shocking!There are plenty of loungers - 6 or 7 I believe... there is not a lot of shade - one umbrella, which I sat under most of the time being the palest! However if there had been a few of us"pastey-types", it would have been difficult to all sit in shade. The flowers surrounding the pool area are gorgeous, with butterflies and dragonflies dancing in and out - just magical. The gardens are beautiful, and we regularly walked round. Perfect for kids to play in - hide and seek would be great I imagine! There is a marshy pond area to be aware of however. The location: Lovely place to go in the middle of agricultural france. Definitely need a car!! Very rural, with vineyards about 20 minutes away. Plenty of Chateaus around as well. All in all a lovely place, very rural, peaceful and thoroughly enjoyable. Merci beaucoup pour votre retour thank you so much for your review, we will be very please to see you an other time. Accueil sympathique de Claudine et Christophe, avec la surprise de quelques produits régionaux,. Jardin superbement entretenu, piscine très propre. Warm welcome. Idyllic setting in an area overflowing with things to see and do. The property, all restored and built by Monsieur has everything tha.t you could need and Madame could not have been more charming and welcoming. The house is a lovely old building, nicely renovated with lots of original features, comfortably furnished and beautifully clean. The kitchen is small but equipped with all the gadgets you need and there are good modern bathroom facilities with great showers. We enjoyed most of our meals in the courtyard, beautifully shaded by the mimosa tree. The hotplate/barbeque was put to good use with al frescoe dining on a couple of occasions. The highlight for us was the pool, which is salt water - no nasty chemicals! We made good use of the many loungers and the spa. Claudine and Christophe live in the adjoining part of the house, but they were in no way intrusive. They were really helpful and were very generous with the delicious fresh produce from their kitchen garden. There are large well tended grounds open to guests and we enjoyed strolling through the avenues and walk ways. For any star gazers the skies are light pollution free and provide very clear viewing with the pool side loungers proving very useful for looking up and binocular gazing. We are very please that you enjoy your stay, we are always very happy to share the produce of our Garden, and give our guest all the best. Het grootste deel van de kastelen en wijngaarden zijn zeer dichtbij. Er zijn ook geheime plaatsen te ontdekken, zoals de prachtige abdij BOIS AUBRY (3 km), historische dorpen en middeleeuwse stad: Chinon, Loches, RICHELIEU ... etc. Theme Park: FUTUROSCOPE is een fantastische themapark van het bewegend beeld met 3-d, de beroemde dierentuin van BEAUVAL. Lokale markten.